← LC Cruise for 2013 Nearly Here – With Updates! Reporting from 6th Annual Low Carb Cruise 2013! Today is nearly the end of the Low Carb Cruise (how did it all go by so fast?) As always in the low carb world, there has been a bunch of new information, a rehash of some of the older information, and lots of fun to be had. Yesterday was our Belize stop, but Howard and I stayed on the ship. We have been to Belize’s beautiful animal sanctuary in the past, and are a little bit tired from all the activities, so we went and sat near the waterworks on the ship and enjoyed getting an occasional cool splash. Howard was interviewed for a documentary yesterday, soon to be announced, as I enjoyed watching the process. Since the topic was “how low carb has changed my life,” and my experience has been “fouled,” depending on who you ask, by gastric bypass surgery, I decided not to participate in this particular interview process. Howard had plenty to say, though! We have enjoyed breakfast with Tom and Chareva Naughton, of Fat Head fame, and had a really fun video interview with Dave Asprey, the Bulletproof Executive. Tom and Chareva are working on some children’s materials in the Fat Head way of thinking, and Dave – wow – I wish I had half his energy, and I’m working on that! Dave seems less like an “executive” than pretty much anyone I’ve met. Wish my previous “executive” employers were more like him, and I’d probably have stayed at my job! We have also met and enjoyed visiting with so many people, and renewing our friendship with old buddies too. This morning we headed into Cozumel for a quick run to see if the stores had anything new (they didn’t). 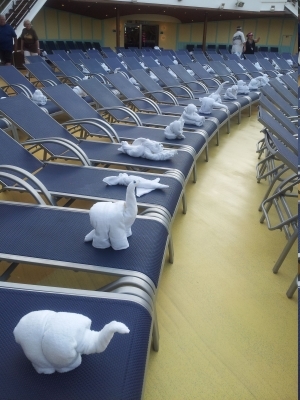 Before we disembarked, as we were crossing the pool area toward the elevators, we were greeted by towel animals on ALL the deck chairs! That was a first for us! Ashore, we did find a new and fun-looking blender. Too bad they were too big to bring home with us. You can see Howard getting some practice in, just in case, even though the blender container part is missing. I think in order to get the blender part on there, and presumably to have something in it, requires the application of money. Later on in the morning we had a long (and partially disastrous) interview with Jimmy and Christine Moore. I say “disastrous” because we had a wonderful video interview, all complete and wrapped up, and then….Howard discovered the audio didn’t record. EVER the gracious and not-too-busy-for us Jimmy and Christine said “Oh, no problem – let’s just do it again!” Howard fell back to his secondary audio method and off we went again. The second time it was a totally different interview, but thanks to Jimmy and Christine’s graciousness, we managed to cover, in an unhurried way, all the original topics again. Except, as often happens, the second time was even better! From watching it, you’d never know we were rehashing the whole thing! This afternoon we’re invited to the Captain’s VIFP (Very Important Fun People) Club party, which is basically an opportunity to get free booze. Last cruise: three sips and I thought they were going to have to carry me back to the room, so we may skip this one. I think Carnival is afraid they’ll be accused of serving watered-down drinks, so they double down on them during the free party. And since the drinks are almost always sweet, that’s a double danger for me. So, one more day of low carb cruise conference, followed by our own private cocktail party. This one, I’m quite sure we’ll be attending. It’s just about our last chance to get those emails and phone numbers before heading home from Galveston on Sunday morning. Once we get home and settled, Howard will work toward getting the video interviews published here on the blog. And I am sure he’ll add his take-aways and commentary too. Stay tuned, folks! 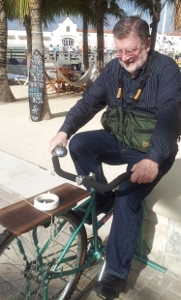 This entry was posted in Low Carb Cruising!, Low Carb Fun, Uncategorized. Bookmark the permalink.